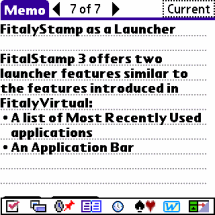 FitalySetup is a separate application which handles all FitalyStamp options, as well as the definition of custom slides and the settings for the Application Bar. These functions are on different panels which can be selected with a drop-down list. 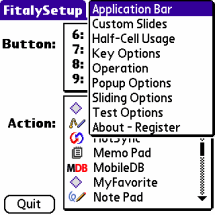 Like other applications, FitalySetup can be opened from the Application Launcher screen. In addition, you can use the Information Menu to jump directly to some of its panels: Application Bar, Custom Slides, Key Options, Sliding Options, and Register. In what follows, we start by reviewing options. Then we cover the important topics related to sliding and custom slides. Finally we discuss the launcher features: The Application Bar, and the list of Most Recently Used applications (or MRU list). 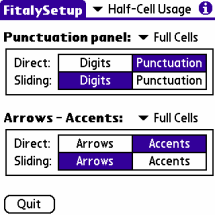 Six of the FitalySetup panels define general FitalyStamp options: Half-Cell Usage, Key Options, Operation, Popup Options, Sliding Options, and Test Options. A pick-list lets you control whether to use half-cells or full-cells on the punctuation panel. If you choose to use half-cells, you get punctuation marks by taps in the upper triangles and digits by taps in the lower triangles. If you select full-cells for the Punctuation panel, you can decide whether Digits or Punctuation marks are obtained directly, that is, by simple taps. If Digits are direct, Punctuation marks are obtained by sliding, and vice versa. Likewise, a pick-list lets you control whether to use half-cells or full-cells for arrows and accents. If you choose to use half-cells, you get accents by taps in the upper half of the keys, and arrows by taps in the lower halves. If you select full-cells for Arrows - Accents, you can decide whether Arrows or Accents are obtained directly. If Arrows are direct, Accents are obtained by sliding, and vice versa. The digits in the upper triangles of the punctuation panel are normally interpreted row-wise, as they appear on FitalyStamp: 12-34-56-78-90. You can set the last two rows of the Umlaut Panel with either symbols or card suits. Normally, keys of the letter panel are sent at pen down, as this is faster. Alternatively, you can choose you to have them sent at pen up, which may be needed for some applications doing word-completion. You can control whether a sound is produced when you tap on the keyboard toggle, which switches the keyboard on or off. In addition, you can controls whether the toggle effect is one-time or permanent. If you select one-time, the keyboard is automatically switched on again upon launching another application. If you select permanent, the keyboard is off until you tap on the toggle again. Set sure mode if you are experiencing digitizer errors. The sure mode, while slightly slower, is able to compensate for mild digitizer errors, which result in occasional incorrect letters. The last option — Enable on reset — is only operational on OS5 devices. The possible choices are On, Off, or Prompt. 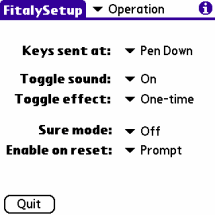 If you select On, Fitaly will be automatically reenabled after a reset. If you select Prompt, you will be prompted after each reset. Displaying the Punctuation panel and the Letter Panel after a tap on an accent key is optional. Most users are likely to want punctuation panels to be displayed. On the other hand, showing accented letter panels may not be that useful, as the position of accented letters is easy to infer. In addition, you can always get an accented letter by a tap on the accent key followed by a tap on FitalyStamp itself. Sliding options allow you to specify the number of pixels needed for a short slide and a long slide. Moves that are shorter than the minimum are not interpreted as slides. They are taken as normal taps. 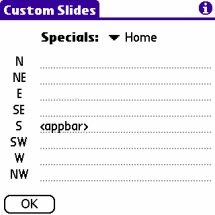 Slides can be used either for capitalization only or for both capitalization and custom slides. In the latter more general case, you can decide which form is expanded by a short slide, and likewise, which form is expanded by a long slide. 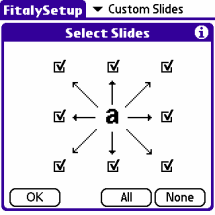 The "a" form refers to the slides defined for lower case letters. The "A" form refers to the slides defined for upper case letters. Finally, the Test Options panel includes some testing tools. Digitizer Tests offer two ways to test your digitizer. The first checkbox works in conjunction with MemoPad. When it is checked, the coordinates of each key you tap are put in a memo along with the letter produced. A tap on the info key goes back directly to the Test Options panel to let you uncheck the option. If you ever forget that you set this option and see numbers after each tap, make sure you uncheck it! The second checkbox lets you see the coordinates of each tap directly in the Test Options panel itself. XY Adjustments shows the X and Y adjustments done by Fitaly when you do an Adjust Position. You can clear these adjustments to 0,0. This is especially useful if your Palm is so badly adjusted that you can no longer get the information menu by a tap on the information key. Custom slides: You may try "Fix database" to restore a (mildly) corrupted slides database. You may tap on "Reset options" to reset all slide options to their default values, for example, if you are not getting the application bar. Clean settings: This button is the ultimate recourse when nothing else works. It resets all preferences to the initial values as for a new installation. 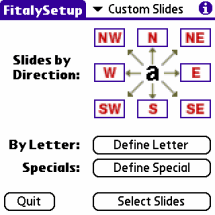 Fitaly 3 allows you to define different expansions for slides in 8 possible directions. To define slides, you can proceed by direction and select one of the directions buttons. Alternatively, you can proceed by letter and define slides for all directions for a given letter. 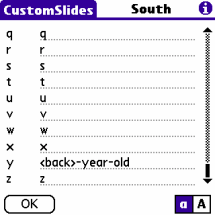 Slides can be defined for keys of the letter panel as well as for special keys: the keys of the side bar and the left panel, the backspace key, and the enter key. With a tap on the W button, you get the custom slides for the West direction – formerly called left slides in Version 2. The dialog acts as a viewer and lets you see all slides defined for that direction. 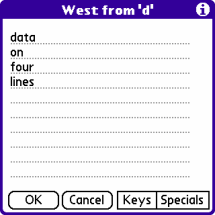 For example, a slide of the letter "a" in the West direction produces an å, the default for that letter. If you want to edit a given slide, a tap on its line opens the editor on the right. As the example shows, the text associated with a slide can include hard line breaks and they are shown as ¶ in the overall view. A Tap on the Define Letter button opens an alternate view showing the slides of all directions for a given letter. To edit a given slide, tap on its line. This opens an editor similar to the one used for slides by direction. To switch to another letter, tap the letter on the Fitaly keyboard. The a A toggles from lower case to upper case as shown on the right. 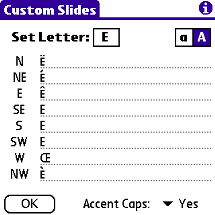 By default, Accent Caps is set to No and all directions produce the capital letter. 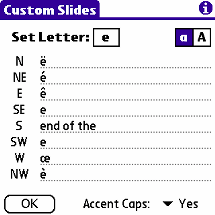 Setting Accent Caps to Yes produces the accented forms as shown in the image. The slide is used to append -year-old to the current text. The macro back before the initial hyphen deletes the last character before adding -year-old. To add macros such as back tap on the Keys button in the editor. This display the possible key macros. Then tap on the button for the desired macro. Home, Calc, Menu, Find, and Toggle. Tab, Caps, Shift, 123, and Info. For each of these special keys, the dialog shows the current function obtained by a slide for each of the directions. A tap on a line opens an editor that allows new definitions. The example on the left has South slides defined to show the Application Bar. In the absence of any redefinition, the line is blank, to show that a slide produces the Home key. Macros such as appbar and lastapp are found on the popup panel displayed by the "Specials" button. 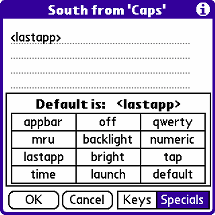 In this example, lastapp – the last application – is associated with the East and South slides of the Caps key. (As Caps is not that much used, we may as well do something useful with it). In addition, the launch and tap macros allow some degree of automation to be achieved by custom slides. They are described below. 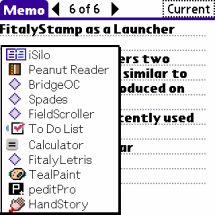 A tap on "launch" on the Specials panel displays a list of applications. Then a tap on one of the applications enters it as a launch macro in the editor. The example shows a North slide of "b" being associated with a macro launching the Bridge application. A tap on "tap" on the Specials panel creates a tap macro to produce a tap on a button. You are then asked to tap on the screen at the desired position, which is then encoded as coordinates in the macro. The example shows a possible use suggested by jazz guitarist Steve Carter. 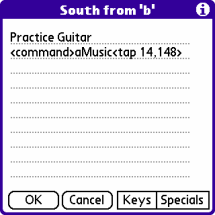 A south slide of "b" within DateBook is used to create an entry "Practice Guitar" together with an attached note. Opening the note editor is done by commanda. Then "Music" is written in the note. Finally, tap 14,148 macro closes the note editor by a tap on its Done button. As this example shows, tap macros allow some powerful automation. The only limitation is that they can only to be used for buttons. They cannot be used to select an item of a list. The Select Slides dialog allows you to select which custom slides you want to enable, direction by direction. 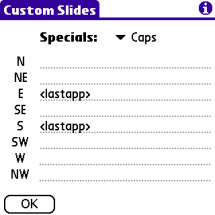 By default, custom slides are enabled for all directions. If a given direction is unchecked, capitals are produced by all slides for that direction, regardless of their length. If a direction is checked, custom slides are produced for that direction. These features have proven to be very popular on the Clié NR70 and NX70, two machines on which the hardware buttons are not easily accessible. 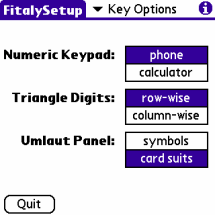 They will be equally useful with FitalyStamp as the keyboard is the starting point of all actions. The list of Most Recently Used (MRU) applications is similar to that of launchers such as SwitchHack and McPhling and you can select any of these application by a tap on its line. The list includes up to 12 applications. Displaying the MRU list is obtained by default with a South slide of the Tab key. As we saw earlier, you can also assign it to some slide of a letter or to one of the fourteen assignable special keys. The second launcher feature is an Application Bar showing icons for user-selected favorite applications. By default, the Application Bar pops up at the bottom of the screen when doing a South slide of the Home key. The Application Bar has 8 icons and its applications are not duplicated in the MRU list. This means that you can get quick access to 20 different applications by combining the Application Bar and the MRU list. One suggestion is to use the application bar for applications that you use so often that you can recognize them by seing the icon only. Less frequent applications will be found in the MRU list. 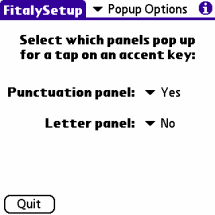 Assigning applications to buttons is done with the dialog displayed on the Application Bar panel of FitalySetup. Tap on any of the buttons entries of the top list and then select the desired action. The assignement will be reflected by showing the selected icon on the Application Bar. 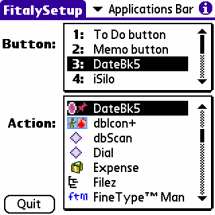 Note that the assignable actions include all applications currently on the Palm device. They also include actions that correspond to the hardware Up and Down button, the pen swipe, and the backlight toggle. Pass-Through Slides make it possible to call several applications that use such slides as their activation technique. On FitalyVirtual itself but not in the light-green areas. Unlike normal slides, Pass-Through Slides are not handled by FitalyVirtual and are passed through to the underlying Graffiti engine - just as if FitalyVirtual were not there. 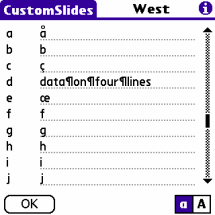 A Pass-Through Slide acts as a slide between the silkscreen buttons shown next to each rectangle. For example, to activate SwitchHack, a Pass-Through Slide from the South-West rectangle to the North-West rectangle will do. And of course, you can be reassured that all of this works with Bozidar Benc's PopUp Calculator and other popup applications! Thereafter, the next character is understood as being in Control state. For example, MagicText uses Ctrl+m to present a list of plug ins. So you can get it by a (short) slide from the Command key to the Shortcut key and a tap on m. Similarly, you can use this control slide to get other plug ins that are linked to Ctrl+0 and others. Although explained in terms of MagicText, this capability is very general and can be used by all sorts of applications. If no application is linked to a key, you will hear a bit (assuming the system sound is on) and the normal key will be issued. The demo version is fully functional and can be used freely. The demo will cease to operate after ten days, after which you can get another ten-day evaluation period by uninstalling and reinstalling the demo. After registration, the software becomes a registered version usable without any time limitation. Registration of Version 3 FitalyStamp and FitalyVirtual is done from the About - Register panel of FitalySetup. The User code can be based either on the User name or on the Device serial number. FitalyStamp registration can be ordered from the FitalyStamp order page.